This is a simple procedure of dragging and dropping files to your origional Kindle Paperwhite while in USB mode. This is not a hack and does not require you to jailbreak your Kindle. That said, I take no responsibility for what may happen to your device in the unlikely event anything goes wrong. 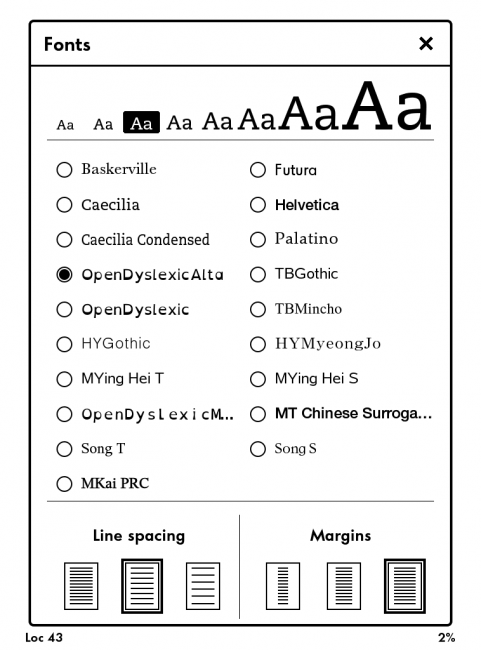 Recently I stumbled on the amazing free and open source dyslexia typeface called ‘Open Dyslexic’. You can download it from OpenDyslexic.org. I find reading numbers to be my main issue. Especially numbers I then have to input into a keypad. I’ve never been diagnosed with dyslexia of any kind but after a few minutes reading the Open Dyslexic font though, I felt a marked improvement with my ability to scan and follow text. I was reading faster and longer than ever before. I was genuinely impressed and really wanted to get the font onto my Kindle Paperwhite for further testing. After googling a few different Kindle hacking sites I found this simple system that requires no real hacking or jailbreaking of your device. As far as I know this only works with the original Kindle Paperwhite running firmware 5.3.1 and above. 1] Connect your Kindle Paperwhite to your computer via ‘USB Drive Mode’. 3] Create a new folder on the Paperwhite called ‘fonts’. The root folder after adding the unspecified file and fonts folder. 4] Drop your TTF or OTF fonts into the folder. I used Open Dyslexic but any fonts will work if they are named in the standard format. 5] After you have added your fonts, disconnect your Kindle and then make sure you restart it from the menu. Mine actually took a couple of restarts as I’d forgotten to eject the Kindle from my Mac but after restarting I opened a book, tapped the ‘Aa’ icon on the top left and there were my new fonts. Reading Open Dyslexic on the Kindle is a revelation for me. I really can keep my concentration and read for much longer than with the standard fonts. 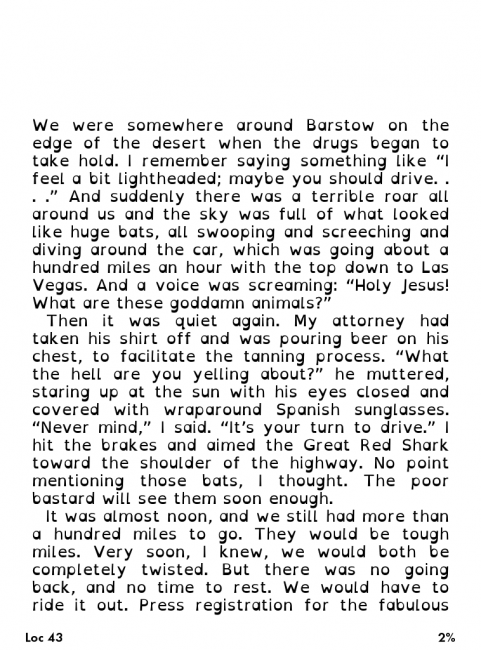 I’m wondering why this kind of typeface design is not installed as standard on all e-readers. I’m using firmwear 5.3.6 on my original Kindle Paperwhite and have no idea if this modification can be made to work on the new Kindle Paperwhite 2. Mostly I’m hearing it doesn’t work on the newer Kindles although if you do get the ‘Please Repair’ message, all you need to do is remove the unspecified file and font folder and restart then the device. That should restore the kindle to normal. Needless to say, before you attempt to tamper with any e-reader you should really back it up. I use Calibre to manage my ebooks. It has all kinds of handy features from adding metadata, converting to other formats and if you install some third party plug-ins you can even remove DRM. 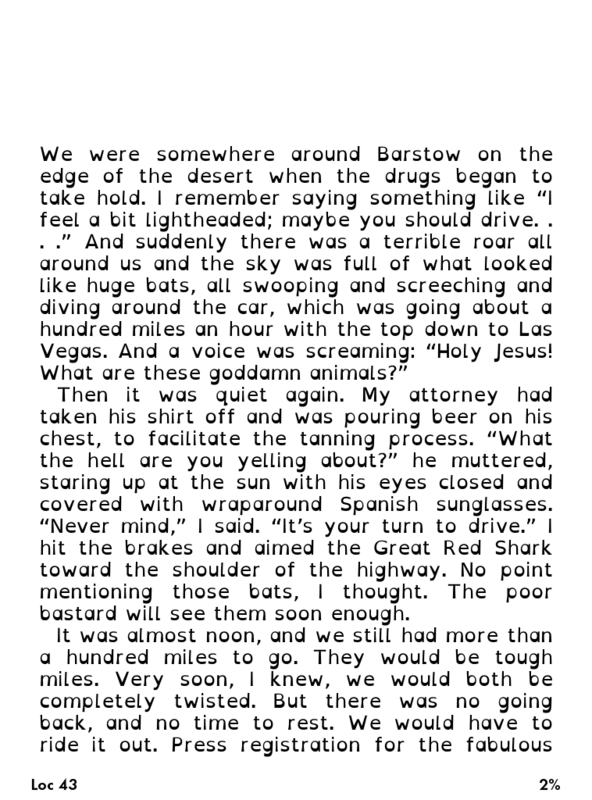 I’ll leave you with the first page of Hunter S. Thompson’s Fear and Loathing in Las Vegas so you can see what the font looks like in a block. I use tight line spacing and a larger spacing may help you even more. For the moment this really suits me. Will the novelty wear off? Perhaps. I’m just amazed at how I’ve previously taken typefaces for granted. Now that I can see firsthand how a simple change in design can affect how I digest information, I’ll certainly be exploring some of the other reader friendly fonts out there. I got an email from a super helpful guy called Grante Marshall who found a workaround for getting custom fonts back onto the kindle PaperWhite after the software update. I used your “Add custom fonts to a Kindle PaperWhite to install open Dyslexic font to my Kindle a few years back and found it really useful. It worked great on my PaperWhite 1st Generation until Amazon updated the software and I could not get it to install them at all. I have manage to find a workaround. Disable wifi on your Paperwhite 1 (airplane mode). Connect your Kindle Paperwhite 1 to your computer (DO NOT DISCONNECT UNTIL LAST STEP! Else the update_kindle_5.3.9.bin file transferred in the next step will be deleted from the Kindle and you’ll have to copy the file over again). 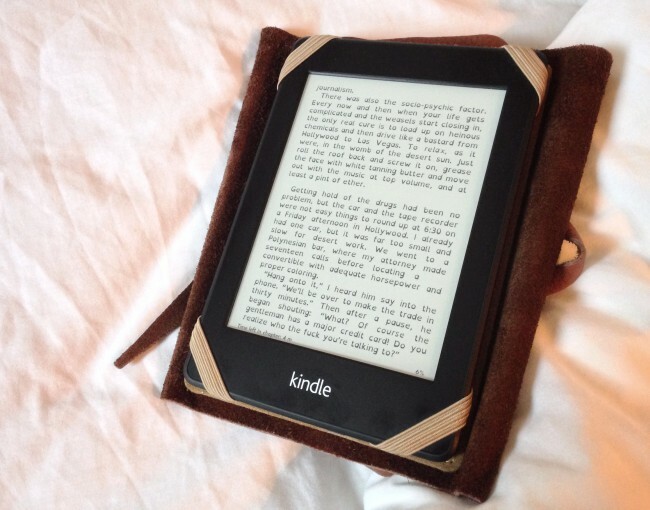 Copy the update_kindle_5.3.9.bin file you downloaded in step 1 to root folder of the PaperWhite. Wait a minute after the copy has completed to ensure the file has completely transferred (DO NOT EJECT THE USB DEVICE AT THIS POINT ELSE THE FILE TRANSFERRED FROM STEP 4 WILL HAVE TO BE COPPIED OVER AGAIN). Wait until the PaperWhite has installed the update. The update in this case is actually downgrade to 5.3.9. Now you can DISCONNECT from your computer. 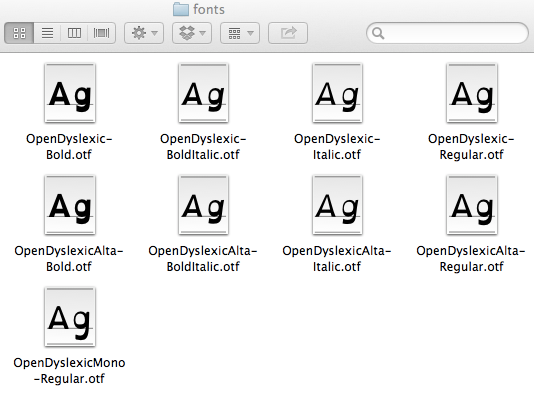 If like in my case the font files were never removed then simply going to Settings and select “Restart” will restart the device and when it comes back up then the open dyslexic font will be available to use. NOTE – If you need Wi-Fi you can connect but try not stay on long as the automatic update will install and the next time you restart your device the update will take hold and you’ll have to repeat the process from step 1. I was caught out by this a couple of times. I hope this is of some use to anyone else. If I can find a way to STOP auto updates then I’ll let you know. And only hours later Grante was back with an addition to the hack. [Do at your own risk though]. Now I’m able to run the Kindle PaperWhite 1 with WiFi enabled to access the Kindle store and all usual online material but no updates downloaded to my device thus all Open Dyslexic fonts all intact. Now back to happy reading once again. Thanks again for sharing the method of installing the fonts in the first place. It’s a pity Amazon have made it so that there is no alternative but to hack the device in order to use these great fonts. I’m sure this procedure invalidates any warranty with Amazon but for me a PaperWhite without the Open Dyslexic font would be a redundant piece of kit so I had nothing to lose. Studies usually find that most people find left justified text easier to read – the regular spacing helps your eyes to flow over the text at a more constant rate while the irregular right hand side provides extra visual cues to your eyes when scanning or reading text to help you know where you are in a page, thus make moving on to the next line easier. Apparently (if memory serves correct!) many printed documents ended up with both left and right sides justfied as the publishers think/thought it looked neater – they weren’t concerned by the readability of the text. Hi, I tried with the new Kindle Paperwhite and the trick is not working for me… Any insights? Thanks! I heard a whisper that it would not work out of the box with the new paperwhite. Hang in there. It is still a new device. Someone will find a way soon. Unfortunately, it doesn’t work with the new 1st Gen update either. At least you can downgrade (no real bugs fixed). This past Friday I sold my Kindle Paperwhite 1st gen. On Saturday I bought my Kindle Paperwhite 2nd gen. I am quite disappointed about this development, I really got so used to read my books with Myriad Pro. I hope someone will soon find an easy hack like the one in this article. If i hear anything i’ll post it here. Fingers crossed. There might be a workaround. In case you didn’t know, there’s a hidden folder called “system” in the root directory of the Kindle. Inside it, there’s an empty folder called “fonts”. I’m going to try drag a font in there, reboot and see if something changes. I was going to do so with OpenDyslexic, but unfortunately I can’t download it. The download page looks empty for me. I just picked up the paperwhite – sorry don’t know which version – I added some of my favorite fonts and just adding the file and fonts folder, this allowed additional fonts, just not the ones I selected – still it has at least 2 different sans serif style fonts, and that was what I was looking for. Maybe one day I’ll figure out how to get the dyslexie font to work, but helvetica works for now. Thank you for the great option!! As someone who has just brought a kindle for this reason (to get dyslexie font for my son), I wish I had done my research an brought a Kobo – the come pre loaded with Open dyslexie font. I am no tech head, and am struggling to do the steps mentioned above. Time to trade methinks. Yes I think the Kobo comes with it as standard now. If I had my time again I would go down the Kobo path.